On Checkout 51’s list this week (Sept 26-October 2, 2013) is Alka-Seltzer Original Tablets, Any size. 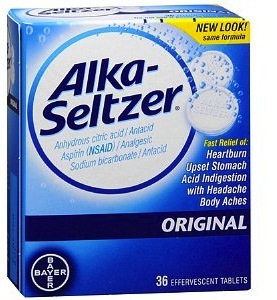 When you feel acid indigestion or heartburn with pain, turn to Alka-Seltzer for fast relief. Alka-Seltzer is an antacid/pain reliever that gently breaks up and dissolves away the full feeling of acid indigestion and pain fast. You will get $1.50 cashback rebate at Checkout 51. Here’s a pic of what it looks like. I found a couple prices of it at a few stores. I didn’t find any other Alka-Seltzer Original coupons to use.